Diamonds are the crown of all gems and have been coveted since ancient times. A diamond is an almost pure carbon mineral which crystallizes in the isometric (or cubic) system. It can be transparent, translucent, or opaque. The stone's hardness is the highest 10 on the Moh's scale - the hardest natural mineral on Earth and it can be scratched only by another diamond. This essentially pure carbon mineral is the hardest natural substance known on Earth. Its hardness is due to its compact and perfect crystalline structure, where each carbon atom is held together in each direction by strong covalent bonds with 4 other carbon atoms. Despite its hardness, it has four directions of cleavage, causing it to perfectly split when hit in any of these directions. It has a very high refractive index of 2.417 and a 3.52 specific gravity. 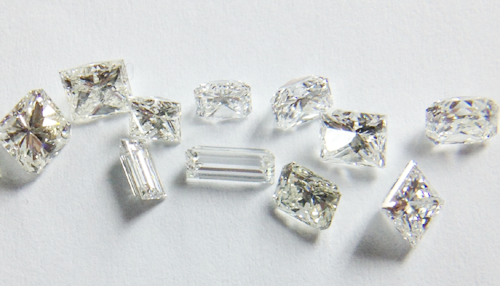 In the trade, the diamonds quality is graded according to 4 parameters, called the 4C's: Color, Clarity, Cut and Carat (weight). The diamond also has remarkable light-propagation properties. It has high brilliance, defined by the reflections of white light from the facet surfaces, as well as high dispersion of white light, which gives the diamond its characteristic "fire", and scintillation, seen as flashes of light when moving a diamond. These properties make it a perfect and extremely desirable gem for jewelry. Diamond is the birthstone of the month of April and the gemstone representing the 60th and 75th wedding anniversaries. Its name comes from the ancient Greek adamas (ἀδάμας), meaning invincible or unbreakable. Ancient civilizations believed that diamonds were formed from lightning or that they were in fact the tears of the gods. Warriors wore diamonds before going out to battles, believing they made them invincible. Pliny (23 AD –79AD), the famous Roman naturalist, in his book from 77 A.D. on natural sciences wrote the following: “Diamond is the most valuable, not only of precious stones, but of all things in this world.” He went further by claiming that diamond is a universal talisman protecting against diseases, evil spirits and nightmares. The diamond is thought to symbolize eternal and lasting love. It is a token of faithfulness and sincerity, a sign of purity and truth. It helps attain one's true potential by dismissing all uncertainty and enhancing self-esteem. It was believed to possess extraordinary healing powers, that helped in curing brain illnesses and to withdraw toxins from the body. Diamonds are formed 120 – 200 Km deep within the Earth’s crust, in kimberlite pipes which are deep volcanic craters filled with blue-green volcanic earth called Kimberlite. In these depths the Carbon atoms crystallized in a perfect structure under extreme pressure and heat conditions and were then thrusted rapidly to the surface during eruptions. Diamonds were originally mined in alluvial deposits in streams, rivers and along the shores of oceans, transported far from their kimberlite pipe origins. It was only since the late 1800's that mining was performed in the kimberlite pipe themselves. India – India was the main source of diamonds in the old world, dating back as early as 800 BC. The diamonds were mined from alluvial deposits mainly in the Golconda region, in Andhra Pradesh. Some famous and high-quality gems are known to have come from these mines, among them the Koh-i-Noor and the Hope diamonds. Brazil – Diamonds were discovered by gold-seeking adventurers early in the 18th century in Brazil. The diamonds were mistakenly identified as low quality minerals and used as tokens for their games. However, it was only after some samples reached Europe and were identified as high-quality diamonds, that Brazil became swamped with independent diamond prospectors. 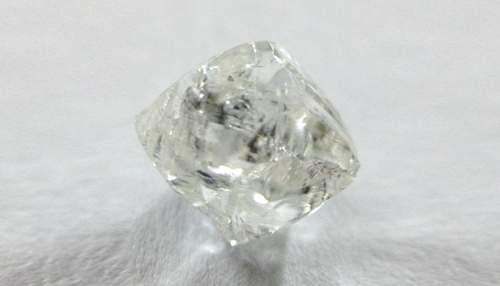 The alluvial deposits in Brazil quickly surpassed the India's production quantities and until the end of the 19th century, Brazil became the world's major source of rough diamonds. South Africa – A chance discovery by a 15-year-old farm boy in December 1865 in South Africa of a 21-carat yellow diamond, later named the Eureka, and another discovery, this time by a Griqua tribesman in 1868 of a 83.5 carat diamond, later named the Star of South Africa, were the trigger to a great diamond rush to the area. The mining was at first from alluvial deposits, however, it wasn't before long that the kimberlite pipe source was discovered and mining of the kimberlite pipe began. Thus were the beginnings of the mining town of Kimberley, from which the Kimberlite rock received its name. No story of diamonds and South Africa would be complete without mentioning Cecil Rhodes and the foundation of the De Beers Mining Company. Rhodes accumulated as many mining claims he could get his hands on, even from prospectors who believed their mines were depleted, and when he established the De Beers Mining Company in 1889, he was in control of 90% of the world's production. Over the years De Beers controlled the supply and demand by regulating production output and practicing selective distribution on the one hand and investing in marketing campaigns, such as the 'A diamond is forever' campaign from 1948, on the other hand, ensuring its monopoly on diamond prices. Today, De Beers market share is around 40% of the world market. Other African sources include Botswana, which is considered the largest gem-quality diamond producer in the world and the main sorting facility of De-Beers, Ghana, Sierra Leone, Tanzania, Zimbabwe, Namibia, mainly via alluvial and underwater mining, the Ivory Coast, Zaire and Angola. Russia – Intensive mining for diamonds began in Russia since 1954. In 1955, the Mir kimberlite pipe near the city of Mirny, Siberia, was discovered, which produces large quantities of high-quality rough. Today Russia is responsible for around 20% of the world's production and is the largest producer by volume. Austrailia – In 1980, Rio Tinto began production of large quantities of diamonds from the Argyle mines in Western Australia. Although production volume is among the highest in the world, the amount of gem-quality diamonds is rather low. Its importance is in pink and red diamonds, where it produces around 90% of the world's supply and of other colored diamonds as well. Canada – Evidence of Kimberlite pipe deposits, discovered in the Ekati region in the Northwest Territories, Canada, in the early 1990's, led to the beginning of diamond mining and production in 1998. Since then, other deposits were found in the area elevating Canada to the world's 3rd largest producer of diamonds.